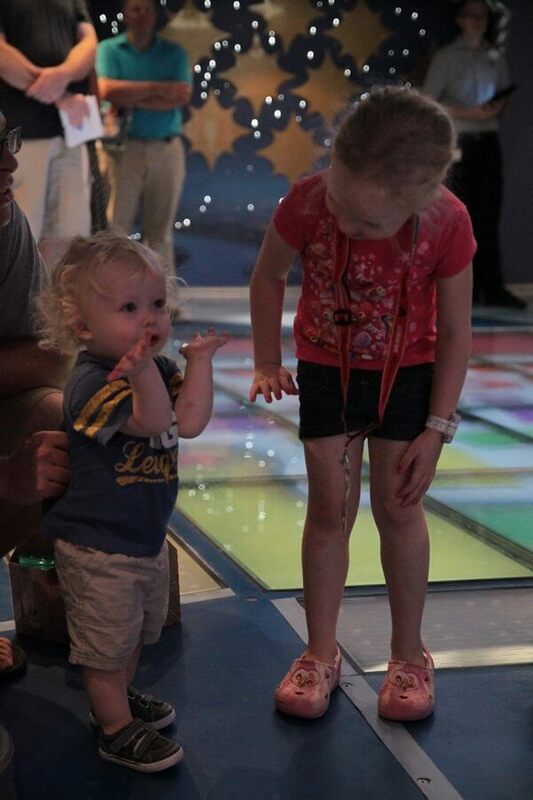 Wake up with Disney Junior is a fun morning dance party in the D-Lounge. | Grainy photo brought to you by 2013. 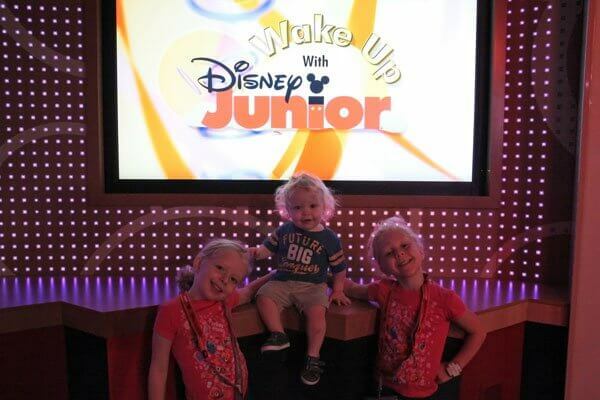 Once we had stuffed ourselves silly, we decided to dance off our food coma at the “Wake Up with Disney Junior” party in D Lounge. 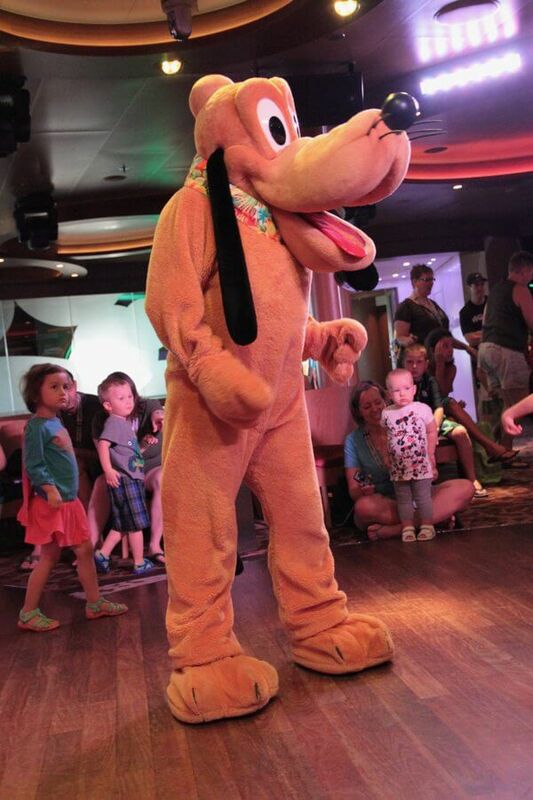 All three kids had a great time dancing with the cruise staff, and the special visit from Pluto sent Nolan over the top. 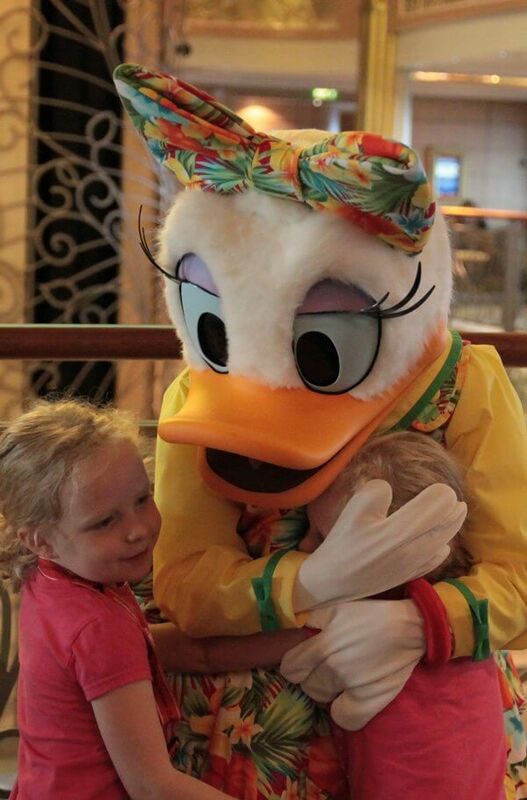 When the party was over, we visited Daisy (and the girls doted over her tropical dress) before heading to the Oceaneer Club Open House. 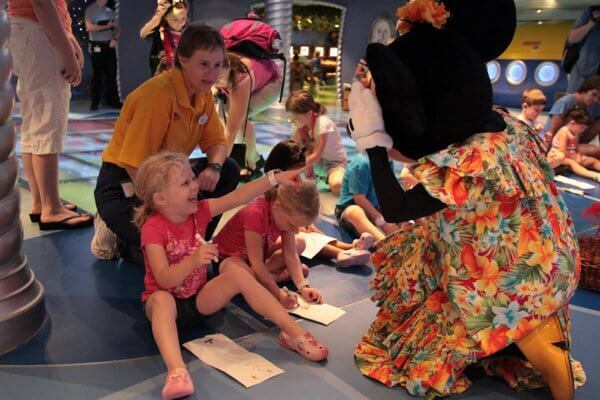 During our Ocean Club open house alone, the kids got to do a craft with Minnie, sing a song with Mickey, and do the hula with Lilo and Stitch. 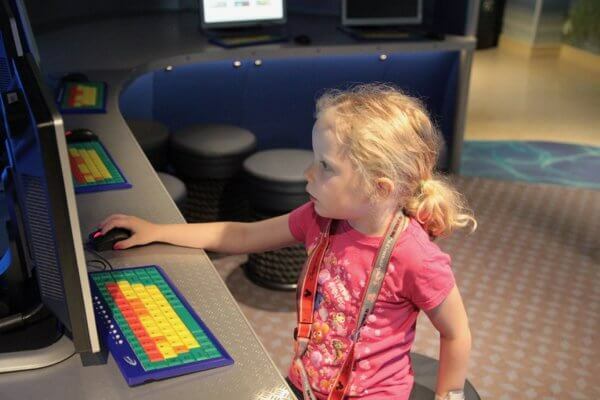 It’s no exaggeration that Disney Cruise Line kids clubs are unparalleled. I wish I could hang out in them more! Avery and Elise got to do a puppet craft with Minnie, and Mickey himself came out and led the kiddos in “The Wheels on the Bus”. Nolan was so impressed that Mickey knew his absolute favorite song in the world. 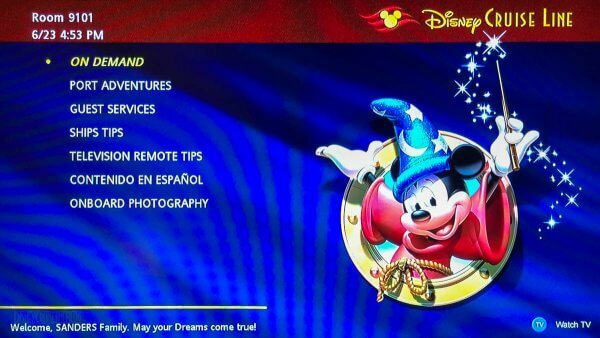 “Allllll through the town!” | Nolan was stoked that Mickey knew his favorite song! 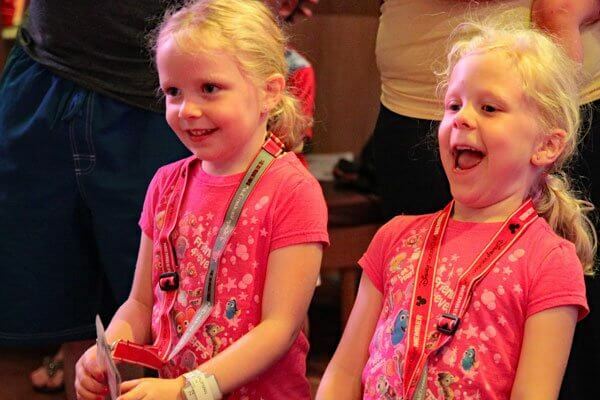 We quickly understood what people meant when they said they had a hard time dragging their kids out of the clubs on Disney ships. By the time we left (less than an hour in the open house) they had also done the hula with Lilo and Stitch. So much fun! 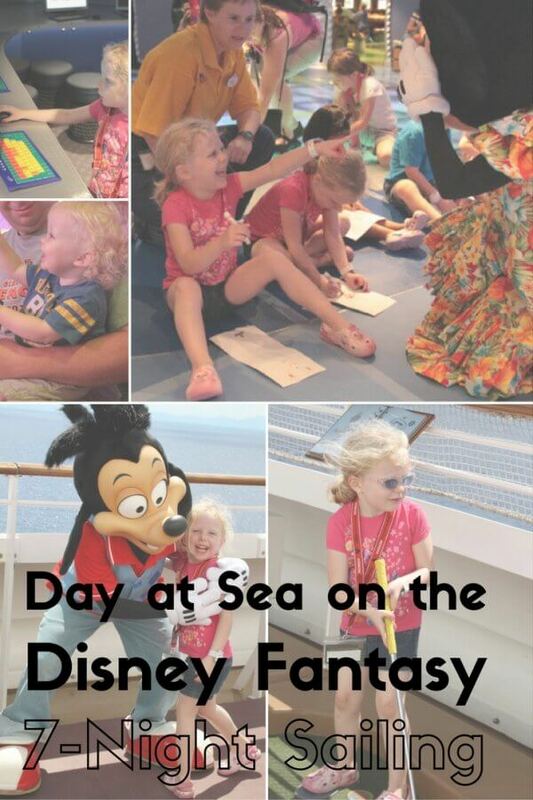 While an exhausted little boy took a nap in our stateroom, the girls and I waited in line to meet Sofia. Despite most of the ship being in line in the atrium below for the Princess Gathering (a meet and greet with several princess, which now requires a (free) ticket you can book online or pick up at the Port Adventures desk on embarkation day), a line was already forming 30 minutes early for everyone’s favorite new Disney Junior princess. 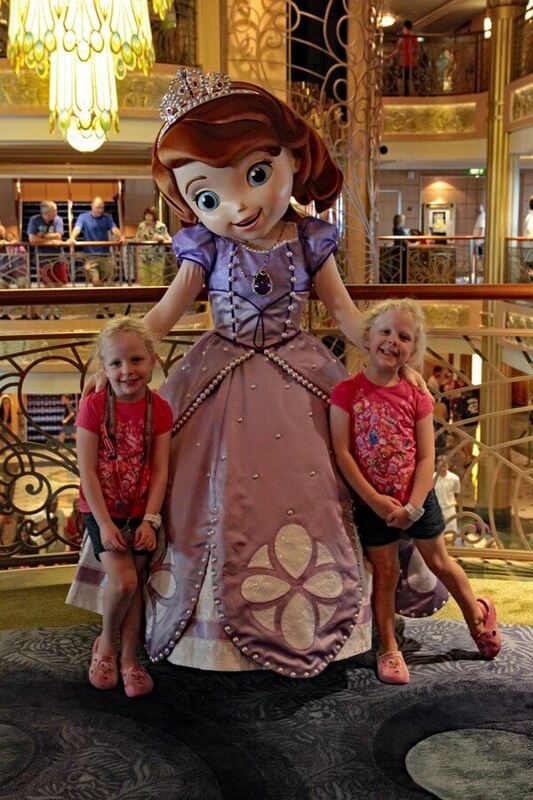 The line wasn’t boring though – we made friends with a Cast Member named Arianna, and eventually got both Sofia and Arianna’s autographs! ? It wasn’t quite lunchtime yet (and Nolan’s early nap was really throwing off our schedule!) so the girls headed back to the kids club for a little while. The plan was for Nolan, Kyle and I too do some exploring, but we all just rested instead. What is a cruise for, after all, if not relaxing?! 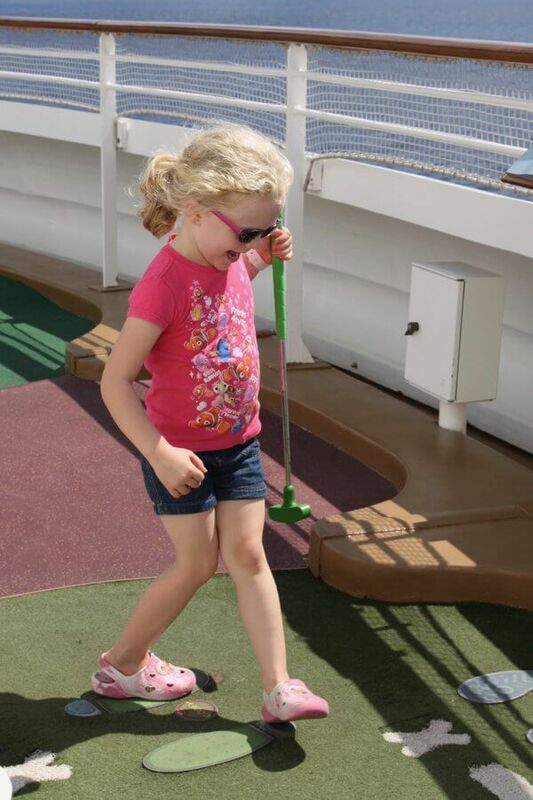 After we had rested long enough, we picked up the girls and ate lunch at Flo’s, while sailing past Cuba (which excited me to no end, a visit being on my bucket list and all). When we had all had our fill (and then some) we went up to the sports desk for a few holes of mini golf while waiting to meet Max Goof. 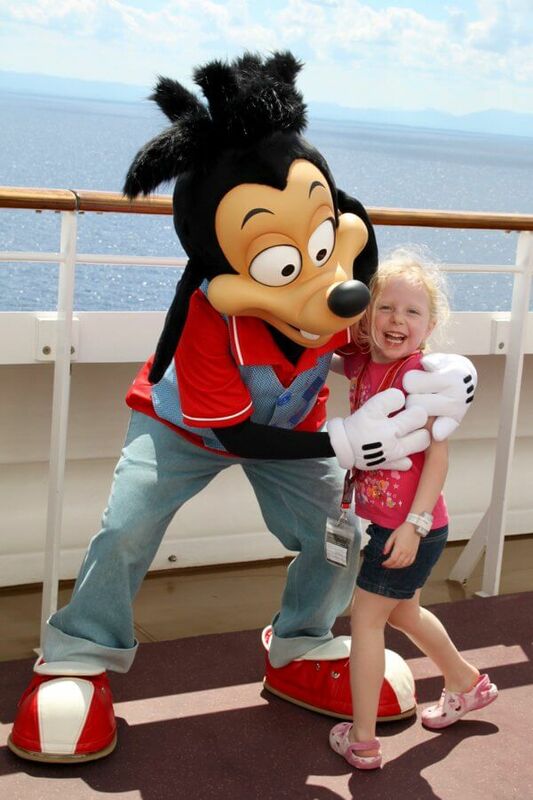 Nolan and Goofy had an especially great time together! Max was also adorable, and the girls were excited to have already gotten two (or rather, three!) new autographs. 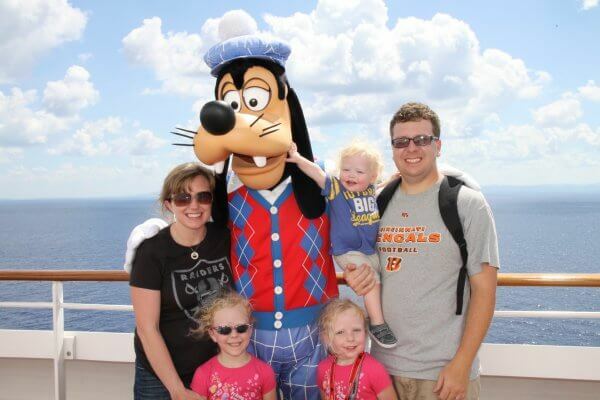 Max Goof was so much fun! 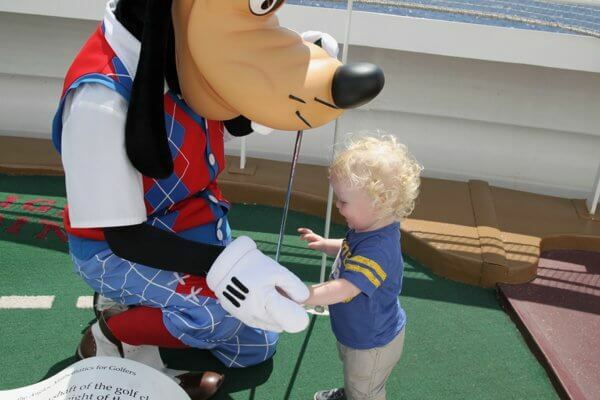 We got to play a hole of golf with him and his goofy pops on the Disney Fantasy sports deck. In the afternoon, Kyle and I were meeting a group for a Mixology class. Everyone went to the kids areas – including Nolan, this time. He was ecstatic! He would only get a few chances to play in the (adorable) “it’s a small world” nursery since it costs extra, but he loved it each time. 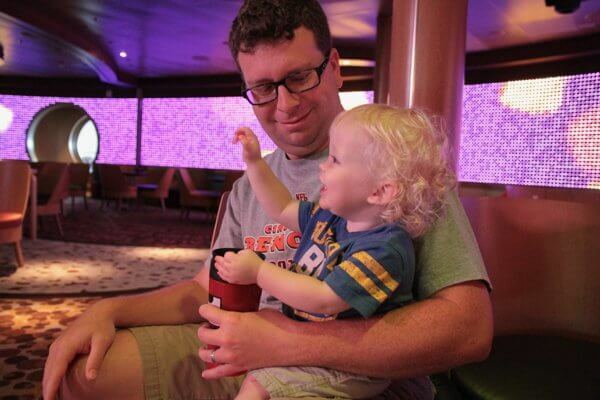 (The nursery is absolutely affordable… it just seemed silly to take him often, when we were paying for the cruise already.) Mixology was a lot of fun, too! We’ve since done several versions, both on cruise ships and at Epcot’s International Food and Wine Festival, and that first one always ranks highly as one of our favorites. After the show, Elise and Nolan both took a nap – and we all got some much needed rest otherwise. It’s remarkable how exhausting a relaxing cruise vacation can be! Dinner was formal attire, so we had made plans to take Nolan to the nursery for a special night with just the girls. It was very sweet, and the food (at Royal Court, on our particular rotation) was spectacular. Afterwards we snuck in a quick swim, a few rides on the Aqua Duck, and a dip in the hot tub before it was time to get Nolan. Everyone was in bed by 9, very ready for sleep!